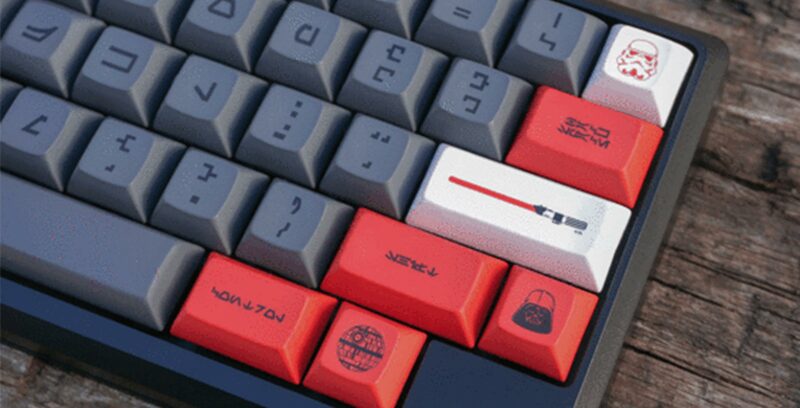 An official set of Star Wars keycaps for mechanical keyboards have surfaced silently like the Death Star rising over Alderaan. The caps are styled to feature the colour scheme of the empire with no Rebel option in sight. The primary keys are dark grey, and then the non-lettered keys are red like a Sith’s lightsaber. There are even small keys that feature Darth Vader’s head, the Death Star, a stormtrooper, a lightsaber and the Empire’s logo. Since the keycaps seem to be being sold by the Sith, they aren’t cheap. When they launch on December 10th, they’ll cost $250 USD (roughly, $335 CAD). But hey, building a Death Star isn’t as cheap as it used to be. The caps can even be purchased in Aurebesh, the main written language in Star Wars. But, for people who don’t read Aurebesh, there is an option that features both English and Aurebesh. You can take a closer look at the keycaps on either Novel Keys’ or Kono’s online stores.